We offer access to professionally selected, diversified portfolio of unlisted growth companies. We plan to list our shares on a public marketplace, enabling our investors to reach liquidity for the value growth of the portfolio. In this offering, B shares of Taikina Capital Oy are offered for subscription. Taikina Capital has two share classes, A and B, and the differences relate to voting rights: A shares have 20 votes per share while B shares have only one. Additional information in this pitch, in section "Information on the issue terms". Please pay close attention to the terms. We believe Taikina Capital Oy (“Taikina”, English translation Dough Capital Ltd) is the first of its kind: An investment company with focus in digital fundraising. We aim to pick the most promising and attractively priced shares and loans from the digital platforms in Northern Europe. Do you want to invest in unlisted companies but don't have the time to select the most promising ones? We provide access to a professionally selected portfolio of unlisted growth companies. Are you worried about the long timelines? It typically takes ages for the unlisted companies to grow and make an exit. In our anchor investor model we will invest in unlisted companies and add to our stake in the follow-on financing rounds when justified. We will be very transparent in our equity holdings and any increase in value will be reflected in our own net asset value (NAV) based valuation. Our strategy is to materialise this value by listing our own share on a public marketplace or make an IPO. Democratization of finance is generally a good thing, giving retail investors access to new opportunities and bypassing much of the old legacy structures of the financial industry. Digital ecosystems include equity crowdfunding, debt crowdfunding, peer-to-peer lending and unlisted equity marketplaces. Widely distributed shareholder base with many consumer-shareholders can be very powerful strategic strength if utilised correctly, particularly in consumer products. Meanwhile, credit platforms have emerged to offer flexibility and return for idle capital waiting to be employed in equity investments. Unfortunately, not everybody has time and money to act as full-time business angels, screen the companies properly or follow the company development and ensure investor interests are taken into account post-round. Shareholders short of time and possibly with just a small amount of money invested per case can be indifferent towards company performance. More importantly, the liquidity of unlisted start-ups is poor since there is no secondary market to sell the shares to, even when the business develops well. Our founder Tero Weckroth discussed these issues in a blog post in May 2018, arguing that a bigger shareholder in addition to small investors can help maintain corporate governance and hold the companies to account. We believe there is a natural role for new type of lead investors like us in private equity placements involving crowdfunding. Our strategy is not to replace the venture capital funds ("VCs”), business angels or retail crowdfunding investors. Between these actors, our position is that of a long term anchor investor. What is an anchor investor? In stock market listings (Initial Public Offerings or IPOs) the company raising funds often meets bigger investors before publishing their share offerings or deciding the terms or valuation. The lead investors include institutional investors, mutual funds, family offices, high net worth individuals and other professional investors. In specialised sectors, they include sector specialists. Since the digital finance ecosystem is still very young, our kind of digital lead investors have not emerged until now. We believe we will be the first to explicitly take this role in unlisted digital fundraisings and most likely will be followed by others. We will evaluate on general level every new case, first in the Nordic countries and eventually also in Germany and the Benelux countries. We are available for pre-round meetings with the target companies to give feedback on deal terms and company valuations. If we find the opportunity attractive, we can invest in the company. Depending on the public / private nature of the financing round our investment can be made public so that the target company can use it in their communication if the round is opened to the wider public and we can use the "crowd" to leverage our investment. In addition to the lead investor role in a financing round, we can make soft or hard commitments to invest more in the next rounds if the company meets pre-agreed milestones. If the company develops their business well and the corporate governance remains good we can play the lead investor role again in all the financing rounds until the IPO. This long-term commitment makes us more than a lead investor in a particular round, into an anchor investor on the company's growth path until exit or public listing. In short, our strategy is to act as an anchor investor for unlisted companies that use or plan to use the digital platforms to widen their shareholder base. Our vision is to become the best known anchor investor in digital fundraisings in Northern Europe with reputation of reliability and responsibility. Liquidity. We aim to make our own share liquid as soon as possible. Unlisted growth companies often take a long time to develop and create value. This will be the case with most of our investment targets too and by investing in them directly, an investor will need to wait for a long time for an exit or stock market listing. Our aim is to offer possibility to materialise value increase by listing our own share in public market place. Our investment strategy will not be purely exit-focused - if justified by fundamentals we are happy to continue owning a profitable and dividend-paying company. Our evergreen structure (i.e. no pre-determined lifetime or end-date) makes this kind of long-term creed possible. We won't need to exit promising companies for our internal reasons before the full value is realised. We aim to enable our investors to realise the value increase by making our own share liquid. Diversification and stock selection. As a bigger and more professional investor, we are able to follow the deal flow more widely than a single shareholder can and compare a prospective deal to peers on a wider scale. This will enable us to diversify the risk over bigger number of cases and to avoid cases where valuation, company quality or other terms are out of line with peers. We also can gain access to deals where larger minimum ticket size or swift action is required, hence investing in cases that would be inaccessible to smaller investors acting alone. Separately, we can occasionally offer bridge financing for companies that are not yet ready for the platforms or distributed shareholder base and need help from us. Valuations. Bigger ticket size will improve the bargaining position in valuation discussions, including later follow-on financing rounds if the company raises more capital. Over time, we expect to build a reputation as a reliable anchor investor and hence gain leverage to negotiate crowdfunding discounts, comparable to IPO-discounts in public stock market listings. Better follow-up and control. Having a larger stake in the company and being able to participate in the future rounds, we will have a bigger influence on the target company governance than multiple small shareholders alone would. We believe the best corporate governance is reached when company has both big and smaller investors in the cap table. Cost synergies. In many platforms the investor fee depends on the size of the ticket (smaller percentage for big investments) and the fixed costs of becoming an investor are common, particularly in Peer-to-Peer platforms. In many equity platforms there are typical €100k or €200k minimum ticket sizes before the investor can invest directly in the target. Smaller investments are directed via an Special Purpose Vehicle (“SPV”), a separate holding company for one investment target only. Administration of the SPVs is costly even in case of failed investments. In successful exits they often cut the profits without ability to offset losses elsewhere against the capital gain. While running Taikina will cost some money too, we believe our costs are very competitive compared to SPV and fund fees. Additionally our success costs are based on profits on the portfolio level instead of separate cases. In the recent decades the investment activity has gradually moved towards unlisted and private company space. Widely referred examples are Apple and Google. Apple was valued at just USD 1.2bn at its IPO in 1980 while Google IPOed at USD 23bn some twenty years later (source: Bloomberg). Inflation, sentiment and company-specific issues play a role but it is generally agreed that more of company value creation has moved to the time before public listing. Equity crowdfunding emerged as result of multiple factors. Partly it was created to offer retail investor access to the unlisted companies before the public listings. The growth was helped by heavier regulation in the traditional financial space. The established players became more cautious and often withdrew from smaller deals. Another major factor has been digitalisation which enabled information sharing and capital movements over the internet and across borders and also made it possible to manage big number of shareholders in unlisted companies. Meanwhile, the same factors have triggered growth of the peer-to-peer (PtP) platforms which directly connect savers and borrowers, cutting off the bank balance sheets. We have a growing market to invest in. The digital investment platforms are growing rapidly although the addressable market is difficult to measure exactly. In 2017 the Finnish equity-based crowdfunding totalled €56m (+123%) but this excludes some of the platforms that did not disclose their numbers for the survey. The Bank of Finland has reported that the total digital finance market, including debt-based crowdfunding and PtP lending, totalled €247m in the same year (+61%). In the Nordic Countries reliable data is not available but University of Cambridge report estimated that the total market in Europe was €7.7bn in 2016 (+41%), mainly focusing in the UK. The market is young and unfortunately much of the deal flow is either bad or overvalued. But there are already some very successful investment cases. Revolut, a UK-based digital wallet which entered Nordic countries recently, raised 1 million pounds in July 2016 from crowdfunding at GBP 42m valuation. This summer the company was valued at GBP 1.2 billion and crowd investors were offered to sell back their shares for 19x return. We started operations on a small scale in June 2017 and cumulatively we have raised 382,000 euros via private equity offerings, mainly from the team members. The first year was spent in demoing and fine-tuning the operating method, including identifying ways to gain return on idle capital held in cas. We also tested the reactions of prospective target companies to our value proposition to them. The outcome of both processes has been promising. We have been able to increase the Net Present Value (NAV) by investing in PtP and other debt instruments and have identified the best platforms to use. We have made three equity investments and they are still held at cost in our books, i.e. they have not been marked up or down during the first year. Meanwhile, the target companies appear to welcome a new anchor investor into the market with possibility to invest in later rounds. Our presence will likely increase the attractiveness of the digital platforms as a method to raise funding. Long-term equity investments. These are the main objective of Taikina and include both high-risk start-ups and more mature, profitable companies. The digital platforms are used for screening and feasibility tests - they enable us to scale more cases than a typical business angel can - but we also look at promising university spin-offs and other companies that are referred to us outside the digital platforms. We always require solid corporate governance and avoid investor-hostile SHAs (Shareholder Agreements). While we don't require Venture Capital-type veto rights or exit clauses, we don't accept non-voting shares or excessive option structures. We also typically avoid SPVs between us and the target companies, due to costs and corporate governance reasons. We will make our equity investments and holdings public. Hybrids. We retain flexibility to invest in unusual structures, when justified by risk-reward ratios. E.g. in some cases the founders don't want to hand out shares permanently and want to guarantee personally buy-back of shares at higher price. Also, convertibles and bridging loans fall in this category. We will keep this category relatively small and require guarantees or collateral. Such cases are not actively searched for but opportunistic investments can contribute to steady NAV growth. Liquidity management. The excess capital that has not yet been invested in equity cases will be invested in corporate and consumer debt instruments via trusted and regulated (i.e. regulator-approved) platforms. This will provide us with profits early in our development but will probably phase out over the long term. In investment portfolios, unlisted equities are still a small and uncommon asset class. Many wealth managers and investment professionals recommend that investors should have 5-15% of their total portfolio in unlisted equities but these have mostly been available to high net worth individuals only. Digitalisation helps to open these opportunities to retail investors but not everyone feels comfortable doing the stock-picking, particularly internationally. In the public markets, retail investors are served by mutual funds, while VC funds provide diversified investment opportunities to institutional investors. Due to the small size of the sensible unlisted equity market, the traditional financial industry has been slow to react. Currently we estimate it is possible to invest around €10-20m in public equity cases per year in Northern Europe while meeting our standards and return requirements. This addressable market has been too small for traditional VC funds which often want a majority or controlling stake in their targets, leading to rather big fund size. Meanwhile, the existing legal structures have not been applicable due to the small size of the market. The legal & admin work related to a fund structure dictates a minimum size of approximately €50m for a fund and the typical fund lifespans of up to 10 years can be challenging for early stage investing in minority stakes. Also, VC funds are typically not open to retail investors. As the ecosystem grows and matures, we believe equity crowdfunding will become a natural alternative for companies aiming to list in the junior markets like Nasdaq First North. Consequently, there should be ample room for companies investing in minority stakes of such companies prior to public listings. We expect our role to grow into one that institutional investors play in stock market listings. Close to us in the market are early-stage Venture Capital funds and business angels. We expect to work in close co-operation with them, providing advice and add-on investments to their cases that are moving towards a financing strategy with a wide shareholder base or a stock market listing. In some cases we may help facilitate sale of all minority shares to a new owner, if the SHA of our targets makes this possible. Overall, our strategy is to complement the ecosystem and not directly compete with any existing players. Deal flow will mainly come from platforms active in Northern Europe which we define as the Nordic,the Baltic countries, Germany and the Netherlands. In addition, we have discussed deal flow opportunities with universities and other research & educational institutions in Helsinki and Turku regions. Many high-quality and high-potential spin-offs emerge from these regions annually but struggle to raise sufficient funding. These are very high-risk investments and can not form majority part of our portfolio. We attempt to find the best and most promising opportunities by co-investing with founders and sector specialists. By leveraging our investment with co-investors on the platforms we can also control risks. Taikina is currently profitable and we expect it to remain so, at least in the near future. The current profits are generated when our excess capital is invested in liquidity management instruments and hybrids. In the near term these profits should grow proportionally with our capital base. In our equity investments we typically commit only a small part of the capital allocated to a project in the first round we participate in. Hence, we "ear-mark" an undisclosed amount of capital to the follow-up rounds. This capital provides near-term returns from credit investments but when invested in later equity rounds, our near-term profitability from this source will decrease. These profits are obviously not our main objective and we expect them to be replaced with much higher profits from exits and dividends from the equity investments. This depends on the success of our equity investments. More importantly, our key metric for the performance will be the NAV per share, in other words the current net value per share. The NAV of Taikina has increased steadily since the company was founded, driven by profits from Liquidity management investments and shortening duration of hybrid instruments. 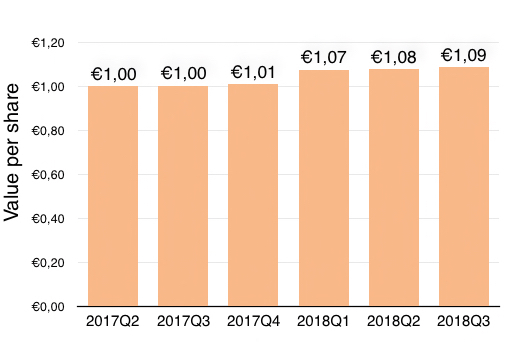 The company started with NAV and book value of €1.00 per share in mid-2017 and at the end of Q3 2018 the NAV per share had reached €1.09. No mark-ups or mark-downs have been made in our equity portfolio which currently consists of investments in three companies (Cloud Insurance AS, Tingent AB and Askel Healthcare Oy). All our long term equity investments are currently valued at cost in both accounting and in our NAV calculations. The roles of the team members are defined by their legal responsibilities as CEO and/or board member, plus by a Shareholders' Agreement ("SHA") between the parties. Tero Weckroth is the CEO of Taikina. Tero believes in people's capitalism and his mission is to improve the health and responsibility of the alternative finance ecosystem, particularly in terms of returns to the investors. Tero is convinced that this requires emergence of professional, responsible and long-term investors in the space. Because these failed to emerge from elsewhere, Tero decided to found one himself. The digital anchor investment concept is developed by Tero. Eljas and Markus are board members, with Eljas acting as the chairman. The board accepts all new equity investments and provides back-up and speaking partners to Tero when he is evaluating the cases. Both have background as entrepreneurs in addition to their day jobs in law and financial journalism. Tero, Eljas and Markus are Founders in the SHA. The Articles of Association and the Shareholders Agreement block transfers of their A-shares and in case of departure from Taikina they must be sold to a new team member approved by the remaining members. The voting rights of the A shares are planned to keep the control of the company in the hands of the founders in the early stages of the company development but eventually, after enough capital is raised, control moves to new investors. Teuvo owns B-shares in the company. As an Advisor, Teuvo is consulted in investment decisions, he informs the board of new potential cases and in case the CEO or a Board Member resigns, Teuvo participates in the decision-making when a new team member is approved. All the team members have paid the full price (NAV at the time) for the shares upon joining. In total the team members have invested €225,000 in the company prior to this round. Note: The CEO of Invesdor, Lasse Mäkelä, has shares in Taikina Capital Oy via his holding company Larzon Capital Oy. Lasse is, however, not part of Taikina team. Tero has 18 years of experience in investment banking, angel investing and entrepreneurship. Prior to this period he worked in the pharmaceutical industry. With special focus in life sciences and fintech sectors he has worked as an active business angel, created multiple university spin-offs and currently serves in the boards of start-up and growth companies. As the business of Taikina grows, Tero will increasingly dedicate his time to the company. He will make the primary screening of Taikina’s behalf for all investment opportunities. Note: Tero is the chairman of Invesdor. 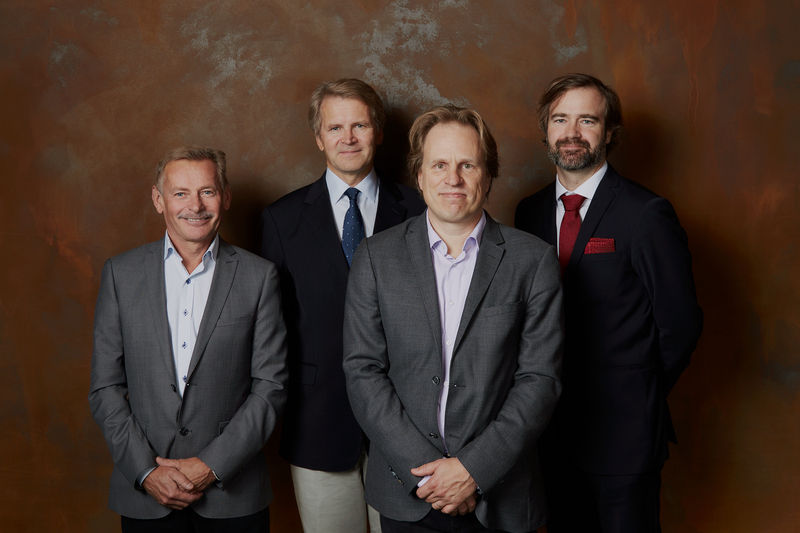 Tero also owns Invesdor’s shares both himself and through his holding company (total 3,9 %). Possible conflicts of interest may arise. More information in terms of investment section of the pitch. Eljas is one of the most experienced entrepreneurs and journalists in the investment scene in Finland. He was the founder and editor of Arvopaperi, a magazine focused in stock market investments. Since 2016 he has worked as an independent entrepreneur with focus in analysing unlisted companies. Note: Eljas is the main owner of Repo Media that has a co-operation agreement with Invesdor. Markus has made a long career as legal council and entrepreneur. As a partner in Hannes Snellman he specialises in capital markets but he has also a 20-year career as an entrepreneur and part-owner of Lautapelit.fi which pioneered the growth of board games in Finland. Teuvo made his career in management and finance in international business, culminating in long service as the CFO of Konecranes. Since 2008 he has been an independent start-up investor and advisor. Teuvo has investments in over a dozen of unlisted start-up and growth companies, particularly in energy, environmental and health care sectors. Note: Teuvo has served in Invesdor board during years 2014-2018. Currently Teuvo owns 3% of Invesdor shares but has no other role at Invesdor.